21 January 2019, 12:12 p.m. 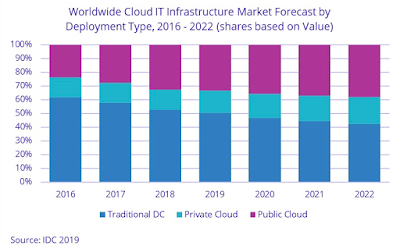 Vendor revenue from sales of IT infrastructure products for cloud environments, including public and private cloud, grew 47.2 percent year-over-year in the third quarter of 2018 (3Q18), reaching $16.8 billion, according to the latest worldwide market study by International Data Corporation (IDC). IDC also raised its forecast for total spending (vendor revenue plus channel mark-up) on cloud IT infrastructure in 2018 to $65.2 billion, with year-over-year growth of 37.2 percent. Quarterly spending on public cloud IT infrastructure has more than doubled in the past two years reaching $12.1 billion in 3Q18 and growing 56.1 percent year-over-year, while spending on private cloud infrastructure grew at half of this rate, 28.3 percent, reaching $4.7 billion. Since 2013, when IDC started tracking IT infrastructure deployments in different environments, public cloud has represented the majority of spending on cloud IT infrastructure and IDC expects this share will peak at 68.8 percent with spending on public cloud infrastructure growing at an annual rate of 44.7 percent. Spending on private cloud will also grow 23.3 percent year-over-year in 2018. In 3Q18, for the first time, quarterly vendor revenues from IT infrastructure product sales into cloud environments surpassed revenues from sales into traditional IT environments, accounting for 50.9 percent of the total worldwide IT infrastructure vendor revenues, up from 43.6 percent a year ago. However, for the full year 2018, spending on cloud IT infrastructure will remain below the 50 percent mark at 47.4 percent. Spending on all three technology segments in cloud IT environments is forecast to deliver double-digit growth in 2018. Compute platforms will be the fastest growing at 59.1 percent, while spending on Ethernet switches and storage platforms will grow 18.5 percent and 20.4 percent, respectively. The rate of growth for the traditional (non-cloud) IT infrastructure segment slowed down from the first half of the year to 14.8 percent, which is still exceptional for this market segment. For the full year, worldwide spending on traditional non-cloud IT infrastructure is expected to grow by 12.3 percent as the market goes through a technology refresh cycle, which will wind down by 2019. By 2022, we expect that traditional non-cloud IT infrastructure will only represent 42.4 percent of total worldwide IT infrastructure spending (down from 52.6 percent in 2018). This share loss and the growing share of cloud environments in overall spending on IT infrastructure is common across all regions. "The first three quarters of 2018 were exceptional for the IT Infrastructure market across all deployment environments and the increase in IT infrastructure investments by public cloud data centres was especially strong driven by the opening of new data centres and infrastructure refresh in existing data centres," said Natalya Yezhkova, research director at IDC. All regions grew their cloud IT Infrastructure revenues by double digits in 3Q18. Revenue growth was the fastest in Asia-Pacific (excluding Japan) (APeJ) at 62.6 percent year-over-year, with China growing at an even higher rate of 88.7 percent. Other regions among the fastest growing in 3Q18 included Japan (48.2 percent), USA (44.2 percent), and Canada (43.4 percent). Long-term, IDC expects spending on cloud IT infrastructure to grow at a five-year compound annual growth rate (CAGR) of 13.3 percent, reaching $88.6 billion in 2022 and accounting for 57.6 percent of total IT infrastructure spend. Public cloud data centres will account for 66.3 percent of this amount, growing at a 13.6 percent CAGR. Spending on private cloud infrastructure will grow at a CAGR of 12.6 percent.